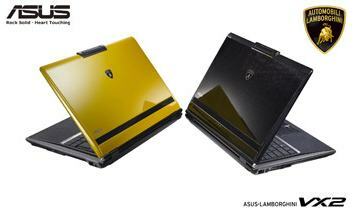 The first details about the Asus Lamborghini VX2 notebook have been released. Just like the Lamborghini cars, this notebook is pretty expensive. The setup with a 15.4" WSXGA+ display, 2.16GHz Intel Core 2 Duo T7400, 160GB HDD, 802.11n draft WiFi, DVI-out and the GeForce Go 7700 will cost you $3,099. The Lamborghini VX2 will be available in Europe and Singapore in the second quarter of this year. The U.S. release date is unknown. Some more info about this notebook can be found in this news post from a few weeks ago.